Yesterday, the real prize of winning the last US General Election was presented to the American people. 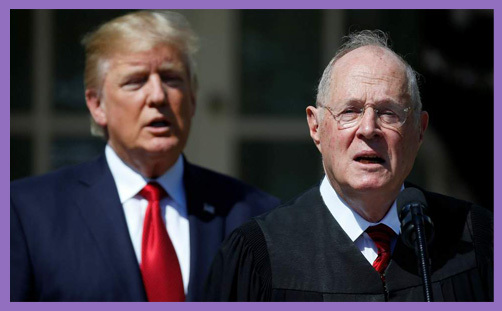 The resignation of US Supreme Court Judge Anthony Kennedy offers Donald Trump the opportunity to nominate a second US Supreme Court Judge, and already he has spoken of how grateful he is to have this opportunity to make a significant mark on his country’s future and, indeed, its history. Early this morning when I turned on the BBC World Service, it was clear that the significance of this was beginning to sink in, as it was the lead story, and immediately our national broadcaster chose to feature the cri de coeur of the Democrat leader Chuck Schumer as he expressed his pain. I have little doubt that in the UK we shall hear this voice taken up by the chattering classes – ‘a terrible thing’; ‘the end of progress’; ‘the triumph of bigotry’; etc., etc. It will be no such thing, and it is one of the reasons I would have voted for Trump myself – unlovely braggart that he is. There have been many changes in recent decades on both sides of the Atlantic on broadly similar issues. The promotion of racial integration, abortion, the restriction of gun sales, the death penalty, and gay marriage. Each of them changed society. You may or not not think any one of them was for the better or worse, but that is not as important as how such change was secured, and how it became accepted. In the UK, legislative pioneers put in the hard yards, often from unpromising starts, and argued in Parliament and outside for society to change and for our legislators to reflect that popular move. It took time, but built on such patiently constructed foundations the decisions, when made, were well-founded and broadly accepted. Most of us, for example, who would not have redefined marriage (though I would happily have made more of acknowledging and respecting stable gay relationships) have accepted that a democratic process occurred which should be respected. There is no mass movement to reverse that change even though, regrettably, David Cameron did not signal an intention to dramatically change an important institution by including that aspiration in his party manifesto when he won power. Contrast the position in the USA: change in each of those hot-button issues was secured not through the ballot box, not by hard work and the patient development of broad cross-party support, but by convincing a single Supreme Court judge to switch sides. When massive social change is rooted on such process, it is little wonder that ‘culture wars’ and some degree of bitterness ensues, which has become rather entrenched. In the US, it is broadly the case that the two coastlines have been turned against the middle; the liberal against heartland America. Three aspects need to be understood about this. It has long been the case that in a nine-member Court, when major decisions have been handed down with 5:4 majorities and the ‘swing votes’ have exclusively been conservative, Republican nominees have been perceived as ‘turncoats’. As Senator Ted Cruz said – himself one of the most brilliant legal minds of his generation and a good choice for the job if he wanted it more than the Presidency – “Democratic picks have always held their party line.” He advocates for President Trump to nominate a safe, consistent Conservative to the vacancy. All these cases have an important philosophical component. Before one asks ‘Do I approve abortion?’ or ‘Should the President be allowed to restrict the entry to the country of citizens of failed/terrorist-sponsoring States?’ one first has to answer the question: ‘Who in a democracy should take such decisions?’ This takes us into the world of jurisprudence, the philosophy of law which looms high in US legal circles. There is even a school of philosophy known as ‘The American Realists’. They advance the proposition that if you want to know what the law is or will be, don’t study the text, study the judges. It was with one eye on that approach that the great US trial attorney Gerry Spence once observed that judges were all susceptible to emotional argument; they do not read statutory texts and interpret them with mathematical logical predictability. Were that so, you would not find dry-as-dust tax statutes regularly dividing the bench on that narrow 5:4 basis. ‘Something’ has to explain that division, and that ‘something’ has to be individual choice/prejudice. Identify that susceptibility, couch your argument accordingly, and you can manipulate that bench however much they pride themselves on their logical detachment. Now, of course, judges cannot rewrite statutes easily, but there is almost always a degree of interpretation available. The former professor at the London School of Economics, American Ronald Dworkin, coined the ‘Hole in the Doughnut’ theory. A statute can be stretched, shaped and deformed in the same way you might manipulate a doughnut, but you can only reshape the hole, not break the outer ring. Nevertheless, huge discretion is potentially available in deciding judges. It is the latter type of judge which President Trump will be looking for, and, when properly understood, it is to my mind the proper approach. Judges should not torture doughnuts – or statutory texts – in pursuit of their own political agendas. The Founding Fathers were prescient men whose philosophical grasp of constitutional principles has never been bettered, but they were men of their time. The notion that they envisaged and wrote implicit approval of abortion or gay rights is frankly absurd. They wrote a constitution that had the capacity to enable such changes; they did not write one that had those changes implicit in the text. We shall doubtless be hearing much calumny poured upon President Trump in coming days as he goes about reviewing his shortlist of replacements for Justice Anthony Kennedy. Few will acknowledge the intellectual substance of his approach. Yet the wisdom of that conservative approach is that it ensures what we have seen in the UK: societal change properly enacted with integrity is accepted and makes for a far less-polarised community; one not constantly at war. The same points could still be made here over Brexit. That decision was made in accordance with a democratic decision made at the ballot box – that was the ‘People’s Vote’. It has been extraordinary to see the anger and anguish of people like Lord Adonis, Tony Blair and Gina Miller, yet imagine how even those levels of outrage would have been heightened had the decision to leave the EU been made on the basis of one Supreme Court Judge switching sides. That is the reason for appointing strict constructionist judges, but Donald Trump is unlikely to get much credit for supporting the integrity of the Constitution from the #FakeNews media on either side of the Atlantic.